Kartik in his infinitely calm manner said “Great!” and left it at that. Serves me right. So much for my arrogance! Of course I am totally wrong. Writer’s block is a legitimate illness afflicting all pens at some point of time or the other. It has affected me too in the past and now I choose to write it off as lack of creativity or interest on my part. A writer should ideally be in control of the situation and never let THE BLOCK get to him. He should be able to search and dig, observe, think and create, no matter what the obstacle. Unfortunately, this requires a lot of training and it takes ages for most writers to come to terms with their own immense potentials. 1) Switch topics. 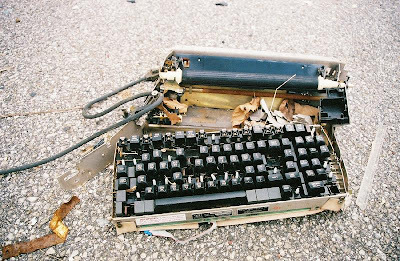 If you are having problems with a particular piece, stop writing it. Go on to something completely different. Something radical. Something new. Something you never thought you would write about. If you’re writing about the shrinking middle class-stop and start writing about some childhood experience that left a mark on you. Your work doesn’t have to be publication quality. It just has to be something different. 2) Take a Break! Yes! Stop writing completely. Give your mind a rest and go recharge yourself. Go out to a delicious Mexican lunch, or invite a friend to tea. Sit in your balcony and watch the leaves rustling in the breeze. Empty your mind of all pseudo-creative thoughts and simply soak in your peaceful surroundings. And watch the ideas rush back when you sit down to write an hour or two later. 3) Read. Read a lot. With or without Writer’s Block. Read and devour as much material as you can get. If you’re facing a block while writing about landscaping, read about gardening. If its sports you’re having a problem with, pick up the nearest sports magazine-be it swimming or polo or golf. Alternately read something completely different. If you’re writing a short story and can’t seem to proceed with the storyline, read a fairytale. If you’re stuck in the middle of a feature article on mystery writing, read a travel book. The bottom line is READ. 4) Write Nonsense. Writing anything and everything that comes to your head, works wonders; not necessarily for instantly curing the block, but it does help a writer to vent when writing becomes such a frustration. Jumbled words, phrases, disorderly sentences or just any nonsense that comes waltzing into your mind-put it down on paper. Who knows? You could glance through the jumble later only to find a new storyline emerging. Whatever it is, it will help you to put down on paper what you have in your head. 5) Call your mother. This is an extreme but drastic measure that ALWAYS helps me. Mother’s usually are storehouses of possible story ideas and talking to one’s mother when one is frustrated (with anything) invariably helps. If not with the block directly but definitely with offloading ones woes. If you cannot call your mother for whatever reason, call your dad or anyone else who is close to you and cares enough to provide moral support as well as inputs useful to your work. This may sound a little desperate, but you’d be amazed at how often this works. And they’re people close to you, so how does it hurt to let go of your pride and turn to them for some aid? 6) Eat healthy and exercise. A healthy body is absolutely vital for a creative mind and a dull, lifeless physical form will not only impede a flow of ideas, but also stop them eventually. The key is to maintain a healthy lifestyle, with a balanced nutritious diet, plenty of water, good amount of exercise in the fresh air and introspection at the end of the day. Try it on an experimental basis and watch the positive change in your writing in a month’s time. Good food and exercise-bound to make a difference to Writer’s Block! 7) Meditate. Having a healthy body is all very well, but emotional and psychological stresses and tensions and a consequent dearth of mental peace, are sure to worsen your episodes of Writer’s Block. The answer-MEDITATE. Meditation and quiet seclusion at the beginning and end of everyday and harmonising body, mind and soul, is bound to open up your thought processes to new ideas. And whoosh! Writer’s Block is a thing of the past! 8) Get a Hobby. Writing all day and night can tire the mind. It is in the nature of the human mind to be stimulated by different things so do just that. When you have written for a good many hours in the day, stop and engage yourself in another hobby of your liking. Bake a cake, play your guitar, clean and organize your home or just listen to some music. They can have a therapeutic effect on your brain and prepare you for another chunk of block-free writing time. 9) Get an idol. Having a hero and idolizing someone for his/her brilliant contributions to his/her area of work, is not only healthy, it is very much required. Read about your favourite writing from the many writers famed in antiquity as well as the present and try to emulate him/her. Start thinking like him/her and begin to search for leads like he/she would. Put up his/her posters/pictures on your desk or on the wall near your workplace, so that his/her achievements are never out of sight. But of course, develop your own writing style. He/she may be your idol, but you are unique. 10) Research online. Read about the various nitty gritties of the topic on hand on the internet. Go online and research whatever material you can find related to what you want to write about and read the distantly related articles written about them too. You never know where an idea may spring out from and hit you square in the eye! And the best part is the internet has limitless information about everything. As such you’ll never run out of things to read about! Writer’s Block sounds scary for aspiring as well as seasoned writers and true enough many writers go months without being able to get over it. Some have even abandoned their careers on account of the block. But in most circumstances it is rather benign and shouldn’t worry you too much. If you want to write, do just that-write fearlessly. Trust in your own creativity and ingenuity and soon, Writer’s Block will just be a harmless concept you once read about ... somewhere. I am amazed !!! You are a genius!! I always knew you had it in you but never in my wildest dreams... !! Christ !! Please continue writing . Mebbe someday (not far away) some publisher will take notice & encourage you to write a book. I am confident that you can write on anything , apple. I always knew that you were the best & in my eyes you always will be. You know what ? You yourself are a piece of magic & I am the luckiest dad on this planet. Period!!!!! !